In April of 1964, Founders and proprietors Hans & Sally Reelick opened Hollandia Nurseries in a small 2-car garage in Bethel. The original retail garden center was located next to the Burger House Restaurant in the Bank Plaza on Grassy Plain St in Bethel, CT. Shortly thereafter it moved to two locations, taking over the Haven Farm on Old Hawleyville Rd where it established its growing facilities and renting a retail location on Stony Hill Rd. Several years later the retail operation was consolidated to Old Hawleyville Rd where it still operates today as Fairfield County's largest premiere garden center. Over the years, Hollandia has gained a reputation as Connecticut's premiere garden center, with hundreds of thousands of plants, first-class display gardens, and annual community events. The Spring Flower Show is Hollandia's main spring event, popular for its series of lectures, garden tours, a season kick-off sale, and representatives from major garden brands. The Fall Festival is a popular autumn celebration coupled with an exhibit of antique trucks, tractors, and farm equipment. Today we’re proud to have over 20 acres dedicated to growing and selling Connecticut’s finest plants. We have 3 acres of breathtaking gardens that serve not only as our proving grounds for the plants we grow and recommend but also as a terrific inspirational venue where you can get ideas for your own garden, or see exactly how a particular shrub or tree will mature. 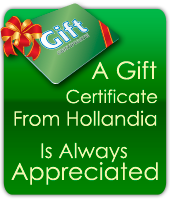 Hollandia's team of experienced experts are always on hand to help. Just bring your questions, ideas, or problems in and find any one of our helpful staff. As longtime veterans of the soil - real garden "gurus" - they will gladly assist you with your needs. Many Hollandia regulars have a favorite staff member they speak with each time they need advice or information. Everyone at Hollandia loves to see things grow. This enthusiasm means that we offer only the best: superior plants, lawn care products, weed and pest control products, tools, mulch, fertilizers, and gift shop items.